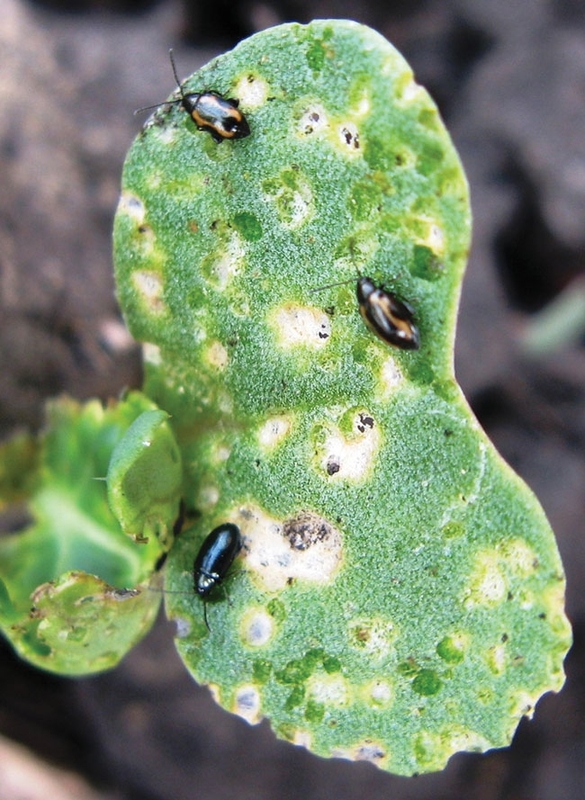 2018 was a bad year for flea beetles in Manitoba canola, according to John Gavloski, extension entomologist for Manitoba Agriculture. There’s no year in which flea beetles aren’t a problem for canola producers; the damage simply varies in degree. The Canola Council of Canada estimates that annual crop losses due to flea beetle in North America likely exceed $300 million. And controls are limited: while producers currently rely almost exclusively on neonicotinoid seed treatments (thiamethoxam, imidacloprid and clothianidin) for flea beetle control, Health Canada’s Pest Management Regulatory Authority is proposing to phase out outdoor uses of these chemistries over the next three to five years due to their impact on aquatic organisms. Should this phase-out occur, producers are likely to shift from neonicotinoids to the diamide group (Lumiderm, Fortenza) as the insecticide component of their seed treatments. These insecticides also offer control of cutworm, says Gavloski. But producers clearly need more options for control. Enter RNA interference, or RNAi, a biological method that uses RNA molecules to inhibit or “silence” gene expression in targeted organisms. There are two ways RNAi can be harnessed for crop protection: by transgenically modifying a plant to express the RNAi molecule in its leaves, or by applying this molecule topically to the plant using a foliar insecticide. Bayer Crop Science’s Ag Biologicals and Syngenta have both been working on RNAi-based foliar insecticide technologies for several years. Bayer’s product, according to Kristin Huizinga, regulatory affairs manager for RNAi, is still in its early stages, but field trials are promising. She says next steps include additional field trials as the company works to refine testing design to match on-farm conditions. “The first step in the regulatory submission process may occur in the early 2020s, at which point we likely plan to submit a dossier to the United States Environmental Protection Agency to support a product launch in the middle of the next decade,” Huizinga says. According to Chris Davison, head of corporate affairs for Syngenta Canada, Syngenta is also in its early research stages with a foliar spray for the control of flea beetles. “We expect it will be several years yet,” he says. Davison says there are many challenges that need to be met as Syngenta develops any novel method of pest control. “In particular, it is important to understand the performance of products under a range of different conditions as well as be able to produce the material at the right quality and cost effectively, to highlight just a few considerations,” he says. Both companies are working with regulatory bodies and other stakeholders as they develop their products. Because RNAi is so new, the regulatory process represents untested waters in Canada, but any new pest control products must pass the PMRA’s rigorous health and safety risk assessments. Jodi Beattie, project lead for Bayer’s flea beetle research, says the advantage of a foliar spray is that producers can target their use of the product to those times when pests reach economic threshold levels. “A foliar application of any kind gives a farmer added versatility and timeliness of when to treat the crop,” she says. Producers are used to using foliar insecticides, adds Davison. Regardless of the method of application, the clear benefit of RNAi is its specificity. Because the process is based on RNA sequences specific to proteins in a target pest, there theoretically should be no effect on other organisms, although researchers must do their due diligence in testing for off-target impacts. This means RNAi-based controls shouldn’t impact beneficial insects in the field, says Gavloski. But there is one potential downside: after consuming dsRNA on a canola plant’s leaves, flea beetles don’t die instantaneously. Gavloski says producers’ alternatives for control are extremely limited. Few cultural controls for flea beetle exist in canola, and while crop rotation is recommended for many other reasons, it doesn’t have much of an impact on flea beetles, which can fly in to the crop from neighbouring fields. RNAi-based controls might not be a silver bullet, but there’s no such thing, anyway, in a business as complicated as agriculture. From the producer’s perspective, innovation in the pest control pipeline is absolutely necessary. “It’s good to have multiple tools in the toolbox,” Gavloski says.